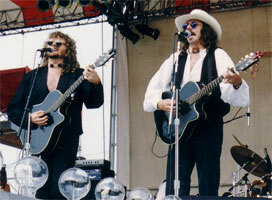 Duo Country US formé en 1992 et composé de Ricky Lee Phelps (né le 8 Octobre 1953) et Doug Phelps (né le 16 Février 1960). Singer/bassist Doug Phelps and singer/guitarist Ricky Lee Phelps first started performing together in their teens, learning to harmonize like the Everly Brothers. After leaving the Kentucky Headhunters in 1992, they formed their own project, Brother Phelps, which contrary to appearances was actually their minister father's nickname. They quickly landed a deal with Asylum Records, and in 1993 they issued their debut album, Let Go, an unassuming record with a more traditional country bent than their often rock-flavored work with the Headhunters. The title track made the country Top Ten, and several other singles made the lower reaches of the charts. The follow-up album, Any Way the Wind Blows, appeared in 1995 to positive reviews, but Brother Phelps decided to disband the following years, whereupon Doug rejoined the Headhunters.